Remove unwanted hair and enjoy long term hair removal with the help of the Beurer IPL 10000+ Salon Pro Hair Removal System. Noticeably reducing the rate of growth of your hair in just a few treatments, the Beurer IPL series for hair removal is ideal for those who want to get rid of unwanted hair quickly and effortlessly. Utilising the same IPL technology used by dermatologists, the Beurer IPL 10000+ Salon Pro Hair Removal System delivers a professional-quality hair removal solution. This advanced treatment lets you experience up to 50% hair reduction after just 3 to 4 treatments1. Clinically tested, the IPL 10000+ Salon Pro Hair Remover is safe to use at home. With an ongoing commitment to safety, Beurer’s IPL hair removal system’s integrated UV filter is safe to use on your skin letting you enjoy silky, smooth skin with confidence2. Thanks to the Beurer IPL 10000+ Salon Pro Hair Remover’s XXL 7cm2 light surface, you can quickly finish your hair removal treatment. As a compact device, the Beurer Hair Remover only takes approximately 26 minutes to treat the entire body. 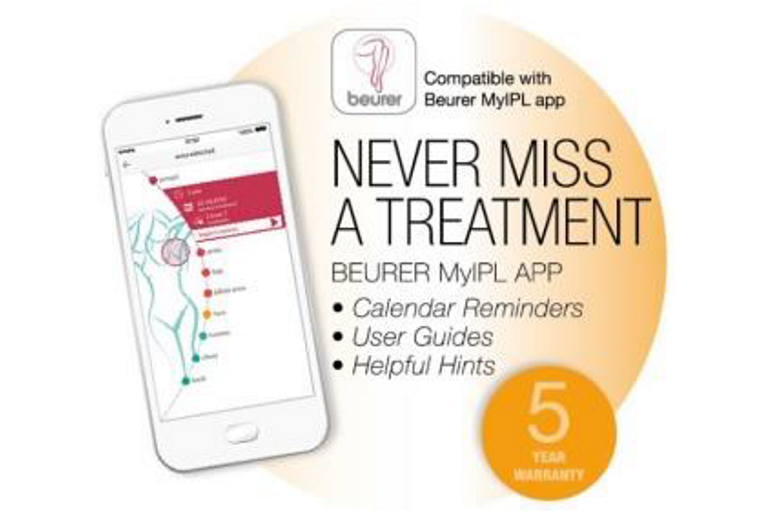 Never miss a treatment and ensure effective use by using the IPL device in conjunction with the MyIPL App3. With the MyIPL app, set calendar reminders, set your hair & skin colour to determine the appropriate light setting for maximum effectiveness, and much more. Featuring an intuitive user interface, the MyIPL App is extremely simple to set up; select your device, choose a body part and select your skin and hair colour. The app will then advise you of the suitable power levels and warn you if you should avoid use due to skin irritations. 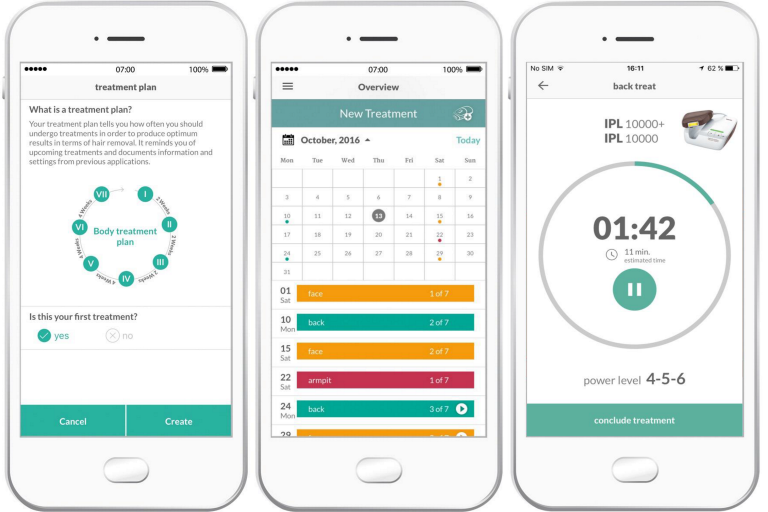 By establishing an individual schedule, the MyIPL app helps you get the most out of your IPL system. Treatment plans are displayed in a calendar and sequences are diarised. You can even set a reminder for your preferred usage time to ensure you achieve the best results. 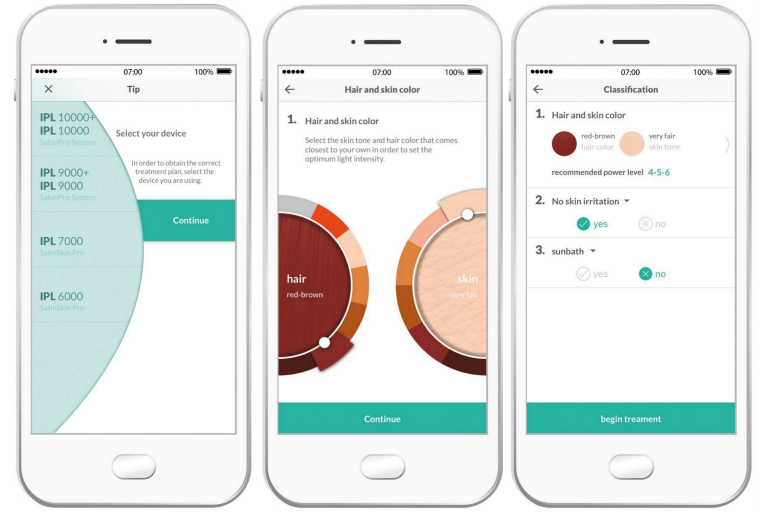 During treatment, the app displays duration and recommended power levels based on your skin and hair tone. 1. Remove the base unit, applicator and other components of the beurer SalonPro System from the box. 2. Check that the cartridge is correctly plugged into the applicator. 3. Insert the mains cable into the socket of the beurer SalonPro System BASE UNIT. 4. Insert the other end of the mains cable into a plug socket. Your beurer SalonPro System is now ready for use. 5. Flip the power switch on the back of the base unit. The indicator lamp and the energy indicator lamp are illuminated and the oise of a fan (similar to the noise a hair dryer makes) can be heard. 6. The device is automatically set to the lowest energy level. The device is then ready to emit the first pulse. 7. The energy selection buttons “+” and “-” can be used to increase or decrease the energy level to set the energy level determined in the automatic skin tone recognition test and confirmed in the skin sensitivity test and/or to adjust the setting to ourrequirements. The energy indicator lamps illuminate green in accordance with the selected energy level. 8. 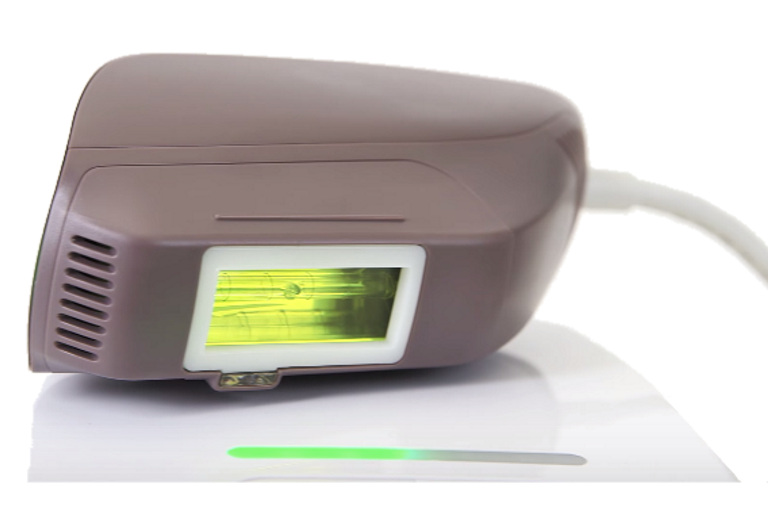 Place the light area of the cartridge on the desired treatment area and make sure it is in full contact with the skin. 1. Does the beurer SalonPro System really work? Yes. In clinical tests performed by doctors, it was proven that the technology in the beurer SalonPro System can be used to safely achieve lasting hair removal results. 2. On which parts of my body can I use the beurer SalonPro System? The beurer SalonPro System was designed for hair removal all over the body. The most common areas that are treated with the beurer SalonPro System are the legs, armpits, arms, bikini zone and the face below the cheekbones. 3. How long does a treatment session using the beurer SalonPro System last? The time can vary depending on the area of the body being treated. A full body treatment (legs, arms, armpits, bikini zone and face below the cheekbones) takes approximately 26 minutes. As the beurer SalonPro System is operated using electricity, it can be used for as long as necessary to perform a full hair removal session on the desired area(s) of the body. 4. Is the beurer SalonPro System safe? 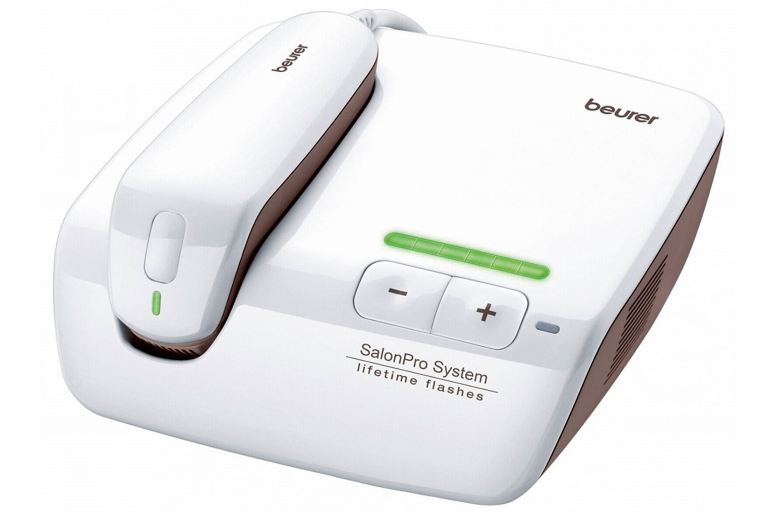 The beurer SalonPro System was developed with a strong focus on your safety and employs clinically tested technology. However, this device – like any other product or electronic device intended for application on the skin – must be used in accordance with the instructions for use and the safety notes for users. 5. Is using the beurer SalonPro System painful? When used correctly, most users of the beurer SalonPro System report a slight warm feeling when the light pulse is issued. Users with thicker and darker hair could feel slightly more discomfort, but this should subside once the hair removal session is finished. The beurer SalonPro System features six energy level settings that you can select according to your sensitivity. 6. How often should I use the beurer SalonPro System? In the case of body hair treatment with the beurer SalonPro System, the first four sessions should be performed two weeks apart. The fifth to seventh sessions inclusive can be performed four weeks apart. Any further sessions should be performed if the hair has grown back until the desired results have been achieved. 7. Is the beurer SalonPro System effective on white, grey or blond hair? results after multiple hair removal sessions. 8. When will I see the results of the beurer SalonPro System? As with all other hair removal devices that are based on light or lasers, the results cannot be seen immediately and you could even think that nothing has happened at all. After a hair removal session, the hair sometimes appears to grow back, but normally, the majority of these hairs will simply fall out after two weeks. Additionally, hair grows in three different stages and the beurer SalonPro System only has an effect on the hairs in the active growth phase. This is one of the main reasons why multiple sessions are necessary to achieve the desired result. 9. can men use the beurer SalonPro System? Although the beurer SalonPro System was developed for women, the device is also suitable for use by men. However, men’s hair – typically on the chest – will require more hair removal sessions than women do to achieve the desired results. 10. Why is my hair still growing although I treated them a week ago? It may seem as though the hair is still growing up to two weeks after a hair removal session using the beurer SalonPro System. This is know as the “ejection” process and, after around two weeks, you will find that the hairs simply fall out or can be pulled out with a slight tug. (However, we do not recommend that you pull on the hairs – simply let them fall out naturally). It is also possible that some hairs are not affected by the beurer SalonPro System due to a missed application or different growth phases. These hairs are treated in subsequent sessions and this is why several hair removal sessions are required to achieve the best results with the beurer SalonPro System.